As we move further into October, some areas of western North Carolina are at or near peak in terms of fall foliage. It’s rather impressive at elevations higher than 4,000 feet. 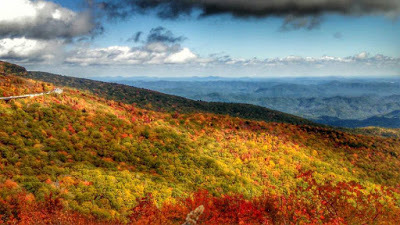 And between 3,000 and 4,000 feet, large patches of Mother Nature’s perfect fall color palette can be found. The colors are also rather bright this year, making for a pleasant fall season! 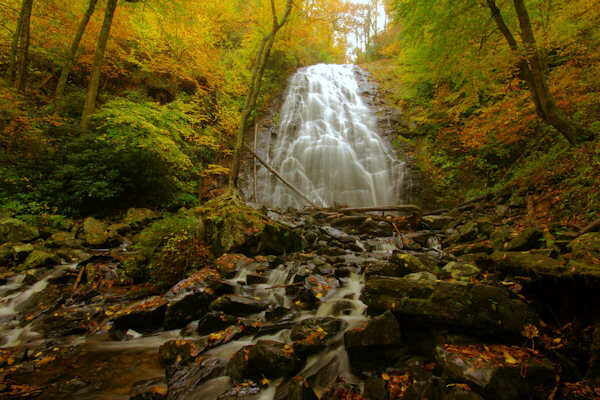 This is the time in the fall foliage season when you will have a first-hand look at the gradual color progression seen in the North Carolina mountains, with higher elevations in full color, tapering to differing shades of green speckled with red, gold and orange below. 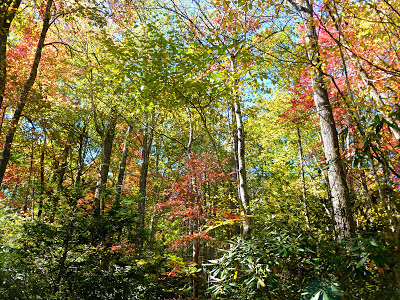 The best way to capture the color change process is by driving from the Inn on Mill Creek B&B on one of the various roads that lead up in elevation to the Blue Ridge Parkway, where you can then take in all the magnificent color ranges from above. Curtis Creek Road (4-wheel drive recommended): From the Inn on Mill Creek, head to Old Fort and go east on Main Street/Highway 70. Not too far out of town, you’ll see the left turn for Curtis Creek Road, going several miles along the scenic creek through the Curtis Creek Recreation Area, which includes camp sites. 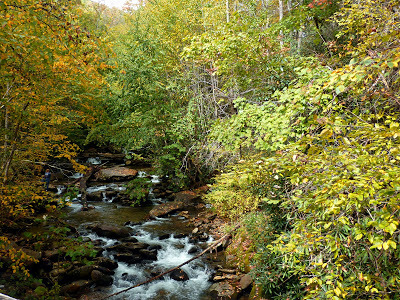 In mid-October, the first part of Curtis Creek Road will be mostly green, and as you go up in elevation, more and more color will surround you until it’s almost full fall color at the Blue Ridge Parkway. Note: a large stretch of Curtis Creek Road is unpaved. When you reach the Blue Ridge Parkway, turn left/south to see Mt. Mitchell and get back to Asheville, or turn right/north and you’ll pass Hwy 80, heading toward Crabtree Falls, Linville Falls and Grandfather Mountain. NC Highway 221: Even further east on Highway 70 past Curtis Creek Road and Highway 80 is Hwy 221, meandering north through a pretty area to the Blue Ridge Parkway at Linville. 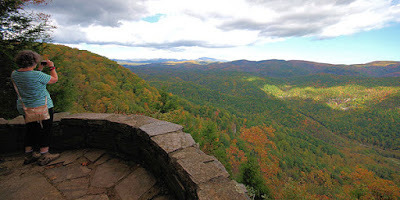 While you’re in that neck of the woods, consider a drive around Grandfather Mountain via the Parkway’s Linn Cove Viaduct, hike to Linville Falls where fall color is progressing nicely according to fall color hunters, check out Grandfather Mountain itself (admission fee required for entry), or check out our favorite overlook, Chestoa View, with Linville Gorge as a backdrop. 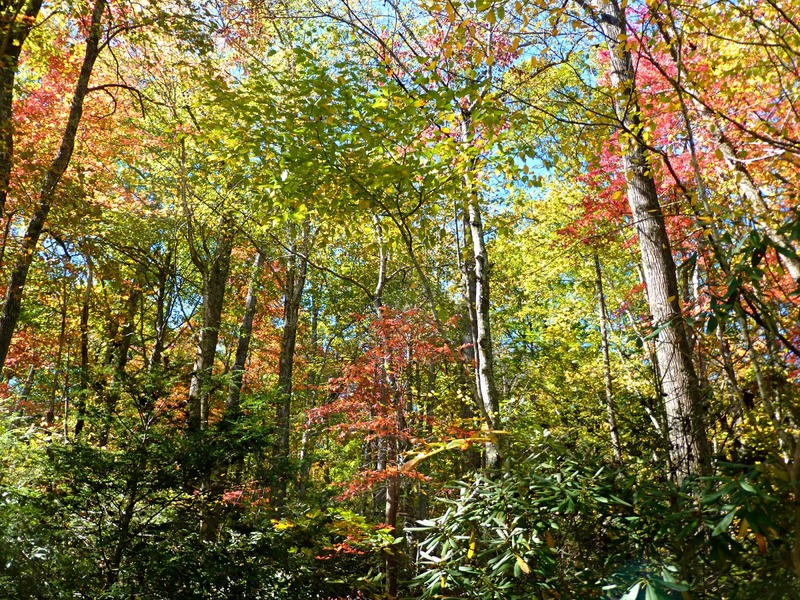 Back at our elevation of 2,300 feet, we are still seeing a lot of green, which is normal for this time of year in the Black Mountain and Asheville area. More trees will change over the next couple of weeks as fall progresses. The maples are starting to join in the color show, and the dogwoods, sourwoods, sourgums, hickory, sassafras and birch are holding their leaves nicely, even after the loads of rain we had. 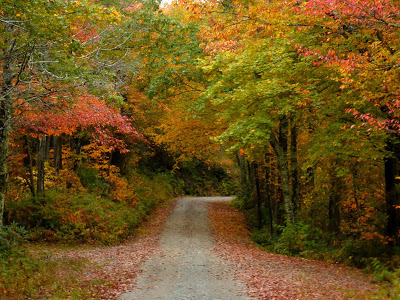 Pisgah National Forest is quite pretty on the road to the Inn! This entry was posted in Fall Color Reports and tagged Blue Ridge Parkway, fall foliage, hiking, Pisgah National Forest, scenic drives by Inn on Mill Creek. Bookmark the permalink.